Fiji has more styles of native war clubs than anywhere else in the Pacific. This is a testament to the fact that Fiji was beset by a long history of warfare and rampant ceremonial cannibalism. There are approximately thirty distinct and diverse types of Fijian war clubs. This article aims to help the reader understand and distinguish the different types of native weapons used in Fiji. To understand clubs and intended specialized functions. I buy native weapons from the South Pacific so if you have a south pacific Weapon to sell send me jpegs and I will let you know what it is worth. Other areas in Polynesia also used Polynesian Clubs but nowhere as profusely as Fiji. 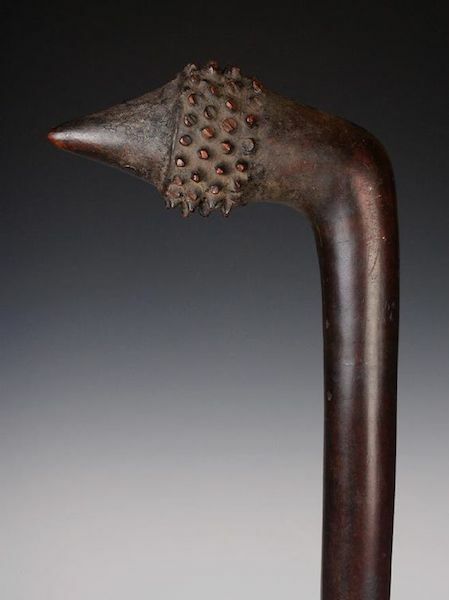 The Fijians used two main types of Clubs, long clubs, and Ula. Ula were a projectile weapon and made to be thrown. Fijian War clubs were the most cherished weapon of the Fijian warrior. Different clubs were for different fighting scenarios. Some native War clubs were for fighting in the jungle while others for grasslands. Many clubs were also status items and were only owned by chiefs or priests. Native weapons that had been successfully used to kill were either inlaid with human teeth or by the cutting of notches on the grip. A club used to kill many enemies thought to have a life power of its own or mana. Native War clubs with large amounts of mana were sometimes placed in a temple to the gods of war. They became ritual objects in funerary rites and certain craft ceremonies. Types of a club can be further divided by surface ornamentation and design, type of wood, and by the type and nature of coir sennet wrapping. If you want greater detail than I can give in a short article, I highly recommend the book Fijian Weapons and Warfare by Fergus Clunie. This book was the major source of information in this article. Kiakavo were typically a dance club used in ceremonial circumstances. They were rarely used for fighting due to their lack of a cutting edge. The area under the head is rounder and not sharp like the Gata or Sali. Kiakavo come in a variety of hardwoods and softwoods and a wide range of sizes. Collectors of native weapons are not keen on Kiakavo due to their ceremonial nature. Kiakavo are the most common form of Fijian war club to come onto the market and are not very valuable. The handle of the club was often covered in sennit string. This is one of the most widely used weapon in Fiji. The angled cutting edge designed to cut through and snap bones. The spur on the very top perhaps represents the open mouth of the striking snake. Also known as Cali or Tebetebe these fijian war clubs are similar to Gata clubs but they have wider cheeks and a more pronounced spur. They similar to a Gata with a cutting edge to snap and cut bone. There is a variety of Sali made from a lighter wood made for ceremonial dances. Sometimes misdescribed as a gunstock clubs. These native weapons come from the interior of Vitilevu and are well represented in museums. Little information is available about this form of weapon but they were probably used in ceremonial dances. They are highly collectable and much sort after. Sometimes misdescribed as a Lotus clubs or axe head clubs they were actually named after the butterfly fish. Known generically as battle hammers they were just that. They are for smashing open the heads of the enemy with a heavy blow. Most examples show great signs of age and use. This native weapon was to drive or peck a neat hole through the enemy’s skull. The weight of the bulky head concentrated in the point of the beak. These clubs were much carried by chiefs in both life and death and according to Fijian tradition. They were particularly favored for murder and in skirmish warfare in thick bush. The heavy head driving the beak through the skull without a long warning swing likely to alert the target or catch on undergrowth. Sometimes misdescribed as a pineapple club. They were being manufactured well before the pineapple existed in Fiji. These broad flat bladed clubs had thin edges cutting through bone like an ax rather than smashing it like a club. They were more sword than a club. The serrated edge could act like a saw. They are probably of Samoan or Tongan origin but so widely used by Fijians as to become a Fijian native weapon. Sometimes wrongly described as a paddle club or spade club due to their shape. 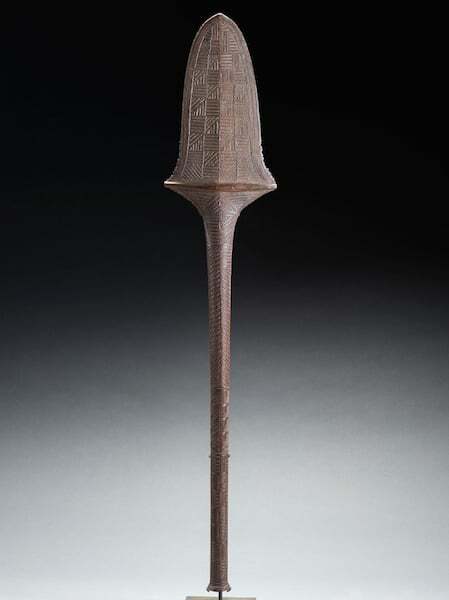 Similar in shape to a Culacula these Fijian war clubs were for chiefs/priests. They are very broad doubling as a shield and as used as a symbol of rank. The blades of a Kinikini tend not only to be broader but are more highly decorated than that of a Culacula. These clubs are rare and highly collectible native weapon, due to their association with chiefs and priests. They are some of the best carved and ornate clubs of the Pacific islands. A moderately rare form of Fijian Club which according to Capel in the new Fijian dictionary describes as having a broadhead shaped like a fan. These clubs have a simple but very pleasing shape. If they have a good Patina can be very collectible. Of Tongan origin, this native weapon was also used with the cutting edge. It was mainly used in the Lau islands and other areas with strong Tongan influence. If you are interested in Tongan clubs please read my separate article. Looking much like a baseball bat they are an oversized truncheon or cudgels for smashing skulls. Some are so large and heavy it makes you wonder at the physique of the warrior who used it. Most are not very collectable but really large examples and those with inlays are. Gadi – A small form of one-handed Bowai that does not flare towards the end. Used as much as a wife beater as a weapon of war. These are also called rootstock clubs. Carved from uprooted saplings the head of the club is the root ball. Favored in open situations like grassland fights due to their reach. They were equally deadly smashing skulls or ribcages. They are reasonably common and have to be in good condition to be collectible. Waka same in form as a Vunikau with only a short section of the main tap root retained. Bulikia same in form as Vunikau but with the taproot having been almost completely removed. Similar in form and function as a Vunikau club only the head has been carefully formed and modified. Ula were for throwing at an enemy and often a Fijian warrior would have several either tucked into his belt or close to hand. It is for this reason they are the most common type of Fijian war club on the market. Ula come in many different forms. A rare form of Ula made possibly as a companion piece for a Bulibuli club. Same head shape. A rare form of Ula with a squarish head in cross section.